Late 1895. Sherlock Holmes and his faithful companion Dr John Watson are called upon to investigate a missing persons case. On the face of it, this seems like a mystery that Holmes might relish, as the person in question vanished from a locked room. But this is just the start of an investigation that will draw the pair into contact with a shadowy organisation talked about in whispers, known only as the Order of the Gash. As more people go missing in a similar fashion, the clues point to a sinister asylum in France and to the underworld of London. However, it is an altogether different underworld that Holmes will soon discover—as he comes face to face not only with those followers who do the Order’s bidding on Earth, but those who serve it in Hell: the Cenobites. The great detective applies his inimitable intellect to a murder mystery like none other in Sherlock Holmes and the Servants of Hell, a surprisingly credible commingling of Arthur Conan Doyle's classic characters and the soul-shredding subjects of The Scarlet Gospels. That's right, readers: Clive Barker's Cenobites are back—and they may actually have met their match. When Holmes grew bored, it was usually only a matter of time before he took up his old habit of drug use [...] however his penchant for his seven-percent solution of cocaine, administered via a needle he kept locked away in a polished Morocco box, was the least of my concerns after he returned, it transpired. The black dog of Holmes' habit is troubling, to be sure, but still more worrisome to Watson is the fact that his closest acquaintance's "malaise was gaining momentum." Said detective is dismissing fascinating cases with no explanation and plying his elementary trade in plague-ridden areas. "If these were in fact efforts to feel something, to feel alive," Watson worries, "then they might well kill the man instead." It's a relief, then, that "this dangerous road he was heading down: this terrible testing of himself" seems to cease when a couple come knocking on the door of 221B Baker Street. Laurence Cotton's brother Francis has gone missing, is the thing, and the police aren't taking his disappearance seriously—despite the screams the housekeeper heard emerge from the loft he was last seen locking. At the scene of the could-be crime, our chums uncover a void in the decades-old dust that suggests the involvement of a small box, and soon scent "an odd smell of vanilla" masking an undercurrent of what must be blood. From just this, Holmes is convinced that Francis has fallen victim to some dark deed indeed, but the mechanics of his murder are mysterious—as is the motive of the killer or killers—and that comes to fascinate a fellow famed for his ability to explain anything. So it is that Sherlock Holmes and the Servants of Hell starts with "a seemingly ordinary case of a missing person," but this is just the beginning of "something that would open up a puzzle which would find Holmes stretched to his capacity; that would uncover a conspiracy only whispered about, and inconceivable to anyone of a right mind." Of course, Holmes isn't in his right mind at the time of this tale, so when at last he learns of the Lament Configuration—the elaborate contraption that summons the Cenobites in the Hellraiser books and movies—he isn't simply going to leave it be, is he? Instead, he sends Watson off to France—ostensibly to investigate the box's origins but really to have him out of harm's way—and sets about opening a doorway into hell itself. Holmes wasn't a particularly religious soul, and up until now he had been now great believer in the supernatural—but he trusted logic and the evidence of his own eyes. As he'd once said, "once you eliminate the impossible, whatever remains, no matter how improbable, must be the truth." What happened, though, if the truth turned out to be the impossible? 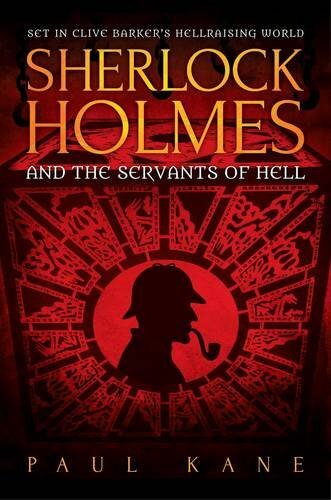 Why, the second half of Sherlock Holmes and the Servants of Hell happens, wherein we bear witness to an escalating battle between a pair of diametrically opposed forces—namely Doyle's resolutely rational characters and the darkly fantastical proponents of pain Clive Barker breech-birthed in The Books of Blood. The authenticity of Kane's take on Hell itself, and its inhabitants, is a scant surprise considering his years of attendant experience, as, among other things, co-editor of Hellbound Hearts—from which anthology he borrows several of the more striking Cenobites who have their wicked way with Holmes and his here—and author of The Hellraiser Films and Their Legacy, a scholarly study of the themes and ideas explored in said series. Markedly more startling is the conviction Kane brings to his depiction of the great detective and friends. Though the sections of the story necessarily narrated from Sherlock's perspective are less impressive, and I could have done without the incessantly suggestive sentences that cap each chapter, Watson's account is otherwise wonderful, with all the "colour and life" of the original writer's romanticised renditions. Kane even takes pains to stitch his story into that patchwork of narrative, such that it is as cleverly couched in canon as Anthony Horowitz's excellent official additions. That's not going to be enough to bring the die-hard Doyle devotees around to this inherently infernal affair, but then, Sherlock Holmes and the Servants of Hell was never meant for them. Less demanding fans are, however, apt to have a blast, and for the folks who felt that The Scarlet Gospels did a disservice to Barker's malevolent milieu, it really is just what the doctor ordered: a whole bunch of bloody fun.